Villa Santa Virginia is in the dominant position of "Tenuta Larnianone" (Wine Estate), of about 140 hectares which produces Chianti wine and Extra Virgin Olive Oil. The Villa is in open countryside despite being only 5 km from the city of Siena. Santa Virginia is surrounded by the peace and tranquility with breathtaking views of the Val d'Orcia, Monte Amiata and Siena. Santa Virginia is a typical and authentic Tuscan farmhouse renovated by the owner for his family with comfort and intimacy. It has a private swimming pool with lovely views from sunrise to sunset. The Villa is spread over two floors for a total of 480 square meters and can accommodate up to 12 people. It is also possible to rent one or both romantic Annexes (for 2 or 6 people) a few meters from the main building. Ground floor: porch, hall, living room with Tuscan fireplace, dining room with traditional fireplace, kitchen, pantry, bathroom. 6. Bedroom with single bed canopy with en suite bathroom (shower). Annex 1 on request. It can only be rented together with the main building. has air conditioning and Fridge. Entrance, double bedroom, twin bedroom, 2 bathrooms (tab and shower), living room with fireplace and fully equipped kitchen. The swimming pool (6m x15m) for private and exclusive use, is available from May 1st to September 30th. The pool area is comfortably equipped and has a shaded area. The excellent exposure allows to have an optimal water temperature and sun all day. LCD flat-screen TVs in the lounge, free Wi-Fi Internet in the house, garden and private pool. A table placed under a large oak tree allows to eat pleasantly in the garden in the shade. Private parking, table tennis, table football, barbecue, garden furniture. Games for younger children are also available. 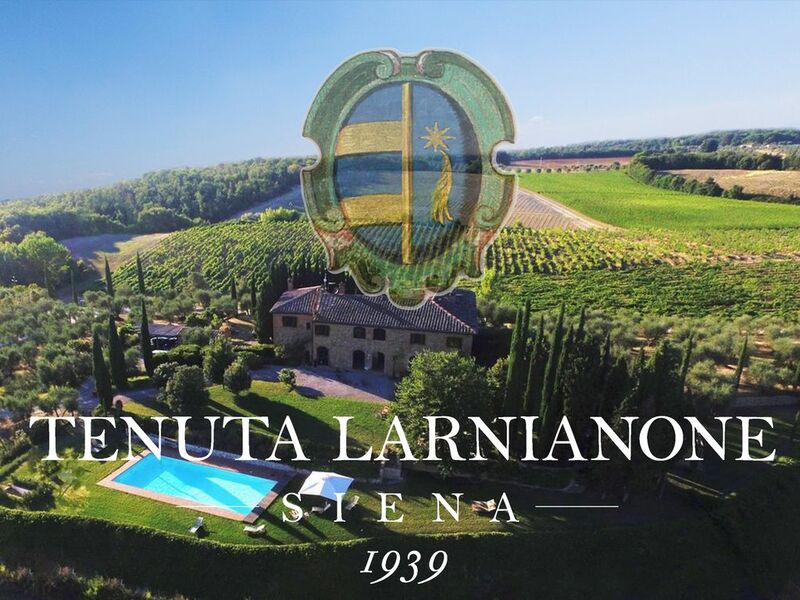 Ask the owner for optional cleaning options and for the cook for typical Tuscan dinners, cooking school in the Villa, visit the winery of Tenuta Larnianone near Villa Santa Virginia. I booked this villa for a group of 8 (4 couples). The layout of the villa was perfect, giving plenty of room and the villa was clean, Duccio and Paola were very helpful and responsive to questions. The views from the villa were stunning and morning runs along the estate roads were ideal for the athletic members of the group. The villa is ideally situated to get to Siena, San Gimignano and visit the main wine regions: Chianti, Montepulciano and Brunello Di Montalcino. We enjoyed beautiful weather and being able to eat and relax outside the villa watching the sunset. I arranged for a cooking lesson at the villa which Duccio organised, this was well received and a fun evening, I would definitely recommend this. Overall this is an amazing villa, well kept, in a stunning location with a host that is available and happy to help with any request. Our group had a very memorable stay here. It was a real pleasure to meet your lovely group. Paola and Lavinia greet you warmly and all of us hope to see you again in the future. We had the most wonderful two weeks in Santa Virginia as a celebration of my 50th and my mums 80th birthday with friends and family of all ages staying with us. The villa is glorious: spacious, beautifully and sensitively restored and furnished and utterly peaceful with the most incredible "filmic" view looking out across the Sienese landscape. The kitchen is very well equipped, and the table football, table tennis and wi-fi by the pool were a big hit with the teenagers. The additional cottage in the garden provided us with the flexibility we needed to be able to invite more family at the last minute. Duccio was the kindest of hosts, responding promptly and efficiently to any questions we had, always going above and beyond the call of duty to help us at various moments of need and providing us with local insight and knowledge (particularly about the Palio- which was fantastic). We thoroughly enjoyed his personal tour of the family winery and the wine itself is completely delicious. It was a completely memorable two weeks and we really hope to be able to return to Santa Virginia again in the very near future! It has been a real pleasure to meet your beautiful family and I hope to see you again in the future. A special greeting to your mother who always had a sweet smile for me. If you can imagine the perfect vacation, it was six women and my little grand-daughter the first week of July enjoying the time of our lives at the villa. Our sincere compliments go out to Duccio and his family for giving us the opportunity to experience this gem. The grounds.on the estate are lovely; the views, breathtaking. The villa is beautiful and comfortable, the pool is perfect with many comfortable lounges and a large umbrella. The wine from the estate and olive oil are delicious. The days are warm, the nights are cool. Thank you to Monica, who prepared two fabulous meals for us. Thank you to Duccio for being such a gracious host and also for securing us great seats to the Palio (which is an event not to be missed). Thank you to his sister for surprising us with delicious tiramisu for the birthday dinner. Our Siena turned 8 at the villa. An unforgettable celebration. She, as well as the rest of us, will remember always this truly wonderful week. Duccio, we send you a big thank you and very much hope to stay at Santa Virginia again. It was, quite frankly, the chance of a lifetime. Our sincere best wishes to you and your family, Diane, Stacy, Siena, Jeanne, Julie, Suzanne and Lindsay. It has been a real pleasure to meet you and your lovely family. I am looking forward to meeting you again in the future when Siena will have grown up. The most incredible experience ever- exceeded our expectations! Wow, I don't even know where to start. Staying at this villa was an experience myself, my friends & family will never forget! We are already talking about coming back in a couple years. To start, the Villa was absolutely breathtaking! The view felt like a painted backdrop, it was gorgeous it didn't feel real. Views of the grain fields, the vineyards, mountains & even the town of Siena was visible. The pool was perfect for those hot days and we enjoyed all the seating / umbrella options for those with fairer skin. The inside of the villa was incredibly charming and there was so much natural light, not to mention loads of character! Each room came with a bathroom, which was very helpful since we had quite a few guests. Several dining options available, each with their own unique quality. Best of all, was Duccio's hospitality! He was so gracious in checking on us to make sure we had all of our needs met at all times. He was so genuine and truly cared that we had a great experience. They also provide their own wine & olive oil for sale (at a reasonable price) and it was so delicious! We all bought bottles of olive oil to take back to the U,S, with us. 10/10 would recommend this place to anyone! P.S. Some others have noted on here that there is no AC unit, which I was a little unsure of before we arrived, however even on the very hot days it was never too hot! The house had a nice breeze flowing through it and stayed surprisingly very cool. Even during peak heat hours everyone was able to nap in their rooms if they chose to. We were two families who stayed at the property in early/mid June. The property was absolutely amazing and what a view! It is a great location for travels to other key cities. We took several side trips (Florence, Pisa, Luca) and Siena is only a 15-20 minute drive. You will definitely want a vehicle to get around. Duccio was very helpful and always there if we needed anything. We highly recommend the property. We were a party of 8 staying for a week. Our only regret was that we didn’t stay longer! The house was stunning, as were the grounds. Six bedrooms all with en suites! The owner gave us a tour of the property and we tasted the wine that they produce, which was delicious! They also produce THE BEST olive oil I’ve ever had! We were only 15 minutes by car to Siena. Don’t miss out on this place. You won’t regret it! The Villa is situated in a prime location for a pleasant stay in the countryside and for visiting Siena (7 km from the center), his' Piazza del Campo, its museums, historic buildings, and the traditional Palio Contrade. You can visit Florence (75 km), Arezzo (67 km), San Gimignano (45 km), Terme di Rapolano (29 km), the beaches of the Maremma (100 km), the UNESCO World Heritage site of the Val d ' Orcia (50 km) and Mount Amiata. The Villa is 3 km from the cycle path de 'Eroica' and the center of the food and wine of the Chianti Classico (12km) and Montalcino (40 km). Cautionary deposit: 2000,00 Euro will be asked on arrival and totally refunded at departure if there will be no damages (it is possible to pay with credit card –Visa o MasterCard) The price includes: Gas, water, electricity, bed linen and towels weekly change, pool towels and wireless Internet and weekly cleaning on Saturday and 3 hours of domestic help (usually on Wednesday) . The price does not include: Tourist tax of 2,5€ per day per person for a maximum of 6 days per month, not applied to children under 12 years old, to be paid at arrival (it is possible to pay with credit card –Visa o Mastercard) and the Heating cost that is charged at effective gas consume (4,5€/mc). The two annexes are rented at an additional cost and they can be rented only with the Villa (if they are not needed they will remain empty). The swimming pool is available from 1st May to 30th September and in function of the season's temperatures. Cancellation policy: 15% of the rent at reservation, 50% of the rent 120 days before arrival; 100% 90 days before arrival The arrival time is scheduled between 16 pm and 19 pm. The Villa must be left by at 10 am on the last day.